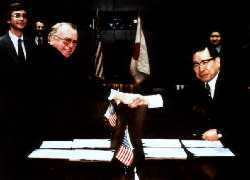 In 1956, the first NC in Japanese private sector was developed successfully. Since then, FANUC have continued to develop new technology into their products. The history of FANUC has been recognized the history of CNC itself. The first NC and SERVO systems in the Japanese private sector were developed successfully. The first commercial FANUC NC was shipped to Makino Milling Machine Co., Ltd. The first continuous path NC in Japan was developed. The first electro-hydraulic pulse motor was developed. The first open loop NC, FANUC 220 was developed. The first NC for linear cutting was developed and made a historic boom in Japan. The first all-IC type NC was developed. The first commercial DNC in the world was completed. The fully modularized NC was developed. FUJITSU FANUC LTD was founded and became independent from FUJITSU LIMITED. ROBOTs were developed and installed in FANUC factories. Dr. S. Inaba, President of FANUC was rewarded with the 6th Annual Memorial Award of "Joseph Marie Jacquard" by the American NC Society. The production and sale of DC SERVO MOTORs were started under GETTYS MANUFACTURING CO., INC license. Wire-cut electric discharge machine was completed. GENERAL NUMERIC CORPORATION was jointly established in the U.S.A. by FANUC and Siemens A.G.
SME Engineering Citation was awarded to Dr. S. Inaba, President of FANUC. The government of People's Republic of Bulgaria decorated Dr. S. Inaba with "Madarski Konnik 1st Degree". The Automation System Laboratory was opened. FANUC USA CORPORATION was established. The commercial production and shipment of ROBOTs started (ROBOT-MODEL 1). KOREA NUMERIC CORPORATION was jointly established by FANUC and Hwacheon Machinery Works Co., Ltd.
FANUC EUROPE S.A. was established. FANUC-MACHINEX JOINT OFFICE was established in Bulgaria. FANUC U.K. LIMITED was established. FANUC GERMANY GmbH was established. The Fuji Factory was completed. FANUC-MACHINEX LTD was established in Bulgaria (formerly FANUC MACHINEX JOINT OFFICE). The Emperor Showa awarded "Medal with purple ribbon" to Dr. S. Inaba. FANUC MECHATRONICS S.A. was established in the Grand Duchy of Luxembourg. The Technical Training Center was opened. GMFanuc Robotics Corporation was jointly established in the U.S.A. by FANUC and General Motors. 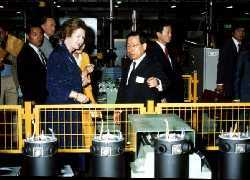 On July 1, the corporate name was changed from FUJITSU FANUC LTD to FANUC LTD.
On September 19, Lady Margaret Thatcher, the then British Prime minister, visited FANUC Fuji Complex. 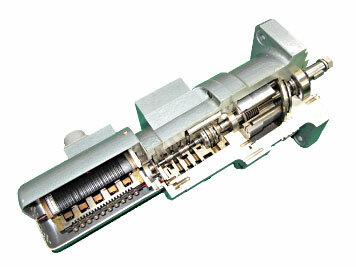 AC SERVO MOTOR was developed. 600 FANUC ROBOTICS LIMITED was jointly established in the U.K. by FANUC and the 600GROUP PLC. On November 26, His Royal Highness Crown Price Henri of the Grand Duchy of Luxembourg visited the FANUC Fuji Complex. 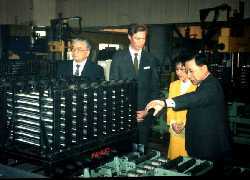 On July 11, His Majesty the Emperor (the then Crown Prince) visited FANUC Fuji Complex. Upon completion of the new Head Office, the CNC Factory, the Injection Molding Machine Factory and the Basic Research Laboratory at the foot of Mt. Fuji, FANUC Headquarters were moved there from Hino City, Tokyo. The fully electric plastic injection molding machine, "FANUC AUTOSHOT" was developed. FANUC Series 0 was developed. Grand Duke de Luxembourg honored Dr. S. Inaba with the Commandeur de l'Ordre Grand-Ducal de la Couronne de Chene. The Central Technical Center, the Robot Assembly Factory and the Production Technology Laboratory were constructed in the Headquarters area. The Memorandum of Agreement was signed with General Electric to establish a joint venture company for factory automation. 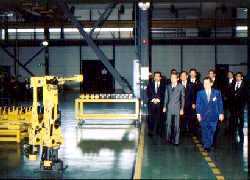 On October 13, the Emperor Showa visited FANUC Headquarters. FANUC TAIWAN LIMITED was established. GE Fanuc Automation Corporation was jointly estabished in the U.S.A. by FANUC and General Electric. Under the new JV company, three operating companies, i.e. GE Fanuc Automation North America, Inc., in the U.S.A., GE Fanuc Automation Europe S.A. in Luxembourg and Fanuc GE Automation Asia Ltd. in Japan were established. 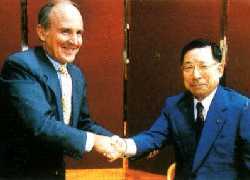 The Asian company was established in 1987. Dr. S. Inaba was rewarded with "J. F. Engelberger Award for Technical Development" by Robotic Industries Association. The FANUC Medical Center and the FANUC Collection of Historical Art Materials were established. Dr. S. Inaba was awarded "the 1987 M. Eugene Merchant Manufacturing Medal" by ASME/SME of the U.S.A. The Product Development Laboratory was constructed in the Headquarters area and transffered from Hino, Tokyo. On June 23, His Royal Highness Prince Willem Alexander of the Netherlands visited FANUC Headquarters. The Tsukuba Factory was constructed. The FANUC Culture Center were established. The Foundation for Promotion of Advanced Automation Technology was established. Dr. S. Inaba was awarded with "the Grand Officier de l'Ordre de Mérite du Grand-Duché de Luxembourg" by the Grand Duke of Luxembourg. His Majesty the Emperor awarded "Medal with blue ribbon" to Dr. S. Inaba. A monument was erected in commemoration of the visit of Emperor Showa to FANUC (its saya-do or "building to enclose it" was named Akebono-Kan). The System Factory and the Hayato Factory were constructed. Dr. S. Inaba was elected as a foreign associate of the National Academy of Engineering of the United States. GMFanuc Robotics Corporation was restructured to become FANUC's wholly owned share hoding company, FANUC Robotics Corporation, together with its subsidiaries, FANUC Robotics North America, Inc., and FANUC Robotics Europe GmbH. BEIJING-FANUC Mechatronics CO., LTD was jointly established by FANUC and the Beijing Machine Tool Research Institute of the Ministry of Machinery Industry of China. FANUC INDIA PRIVATE LIMITED was established as a joint venture with local companies in India. On April 20, His Royal Highness Crown Prince of Luxembourg visited FANUC. TATUNG-FANUC ROBOTICS COMPANY was jointly established in Taiwan by FANUC, TATUNG COMPANY and GE Fanuc Automation Corporation. Fanuc GE Automation Singapore Pte. Ltd. was jointly established in Singapore by FANUC and GE Fanuc Automation Corporation. Dr. S. Inaba was decorated with "the Second Class of the Order of the Sacred Treasure". On May 16, the honorable Dato' Seri Dr. Mahathir Mohamad, Prime Minister of Malaysia, visited FANUC headquarters. SHANGHAI-FANUC Robotics CO., LTD. was jointly formed in China by FANUC and Shanghai Mechanical & Electric Industrial Investment Corp. The new Servo Motor Factory was constructed. On May 15, His Exellency Mr. Natsagiin Bagabandi, the President of Mongolia, and Mrs. Natsagiin Bagabandi visited FANUC. On April 8, Their Majesties the Emperor and the Empress of Japan visited FANUC with Their Royal Highness the Grand-Duke and the Grand-Duchess of Luxembourg. The commercial production of 16i Series CNC started. The Sheet Metal Factory and the Nature Hall were completed. Fanuc India Limited was restructured to FANUC's fully owned company. On Oct. 15, Prime Minister Chinese Zhu Rongji visits FANUC. The new Roboshot Factory and the Cooking Center were completed. FANUC VIETNAM LIMITED was established. On May 20, His Imperial Highness the Crown Prince visited FANUC. The commercial production of intelligent ROBOTs started. The commercial production of 30i Series CNC started. FANUC EUROPE SERVICE GmbH was established. FANUC ROBOMACHINE EUROPE SALES GmbH was established. FANUC CZECH s.r.o. was established. Nagoya Sales Branch was established. GE Fanuc Automation Europe S.A. was restructured and demerged into GE Fanuc Automation CNC Europe S.A. and GE Fanuc Automation Solutions Europe S.A.
FANUC ROBOSHOT EUROPE GmbH was established. The Servo Motor & Spindle Motor Factory was completed. The new Press & Die Cast Factory was completed. FANUC HUNGARY SERVICE and FANUC ROBOMACHINE FRANCE were established. FANUC EUROPE SERVICE GmbH was renamed to FANUC EUROPE GmbH. FANUC SOUTH AMERICA SERVICE LTD was established. GE Fanuc Automation Americas, Inc. changed its name to GE Fanuc Intelligent Platforms, Inc.
GE Fanuc Automation CNC Europe S.A. changed its name to Fanuc GE CNC Europe S.A.
FANUC FA SERVICE LTD, FANUC ROBOT SERVICE LTD and FANUC LASER SERVICE LTD merged and became FANUC SERVICE LTD.
FANUC POLAND SERVICE LTD was established. FANUC NORDIC SERVICE AB was established. The facility of Cut Manufacturing Department of Tsukuba Factory, also known as Akebonosugi (Metasequoia) Factory, and Nagoya Technical Center were completed. FANUC SWITZERLAND SERVICE GmbH was established. The Fanuc Rome bath and the CNC Factory were completed. The joint venture with General Electric Company was resolved and joint venture's FA operations in the Americas were transffered to FANUC America. The commercial production of Delta ROBOT, a Parallel Link Robot, started. European subsidiaries were reorganized with the establishment FANUC Europe Corporation. Subsidiaries in North and South America were reorganized with the establishment of FANUC America Corporation. Collaborative ROBOT CR-35iA was developed. ROBODRILL volume reached 200,000 units. ROBOT volume reached 400,000 units. ROBOSHOT volume reached 50,000 units. CNC volume reached 3,600,000 units. The Mibu Factories were constructed. ROBOT volume reached 500,000 units.